Union Minister of State for Petroleum and Natural Gas Dharmendra Pradhan felicitated students from Jammu and Kashmir for their success in the recently held 2016-17 IIT-JEE (Main and Advance) examinations on Wednesday. Interacting with them at a meeting in the ministry, Pradhan congratulated the students for their brilliant academic performance, but cautioned and advised them not to wrest on their present laurels and achievements, but to strive to excel further in their respective subjects of choice, and contribute to nation-building. On Tuesday, Minister of State in the Prime Minister's Office (PMO) Dr. Jitendra Singh and Chief of Army Staff General Bipin Rawat separately praised and lauded these Kashmiri youth for their academic achievements. While Dr. Singh said that the Kashmir Valley has some of the best talents in the nation and talked about the various new youth centric schemes being initiated by the ruling NDA regime, General Rawat congratulated the students and hoped the students would serve Kashmir eventually. Dr. Singh assured the students that the Centre is ready to support all efforts to realize their potential, and reminded them that 14 students from Jammu and Kashmir have passed this year's civil service examinations. 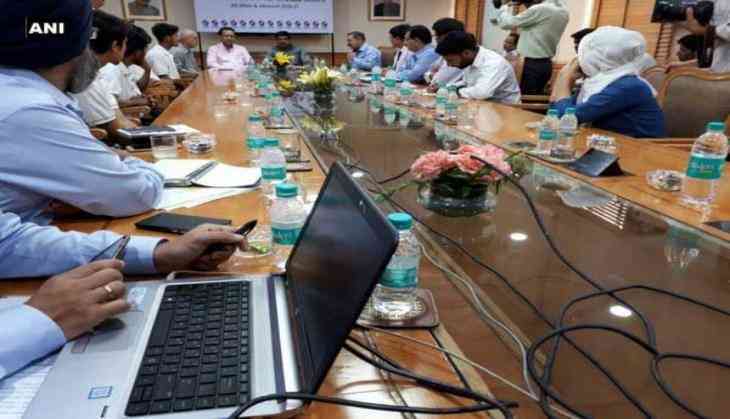 He also praised the result-oriented approach of the 'Kashmir Super 30' (a. k. a Super 40) initiative of the Indian Army with its training partner Centre for Social Responsibility and Leadership (CSRL) and Petronet LNG Limited (PLL). "The project aims to support the talented underprivileged students of the economically weaker sections of Kashmir to achieve educational success by providing engineering entrance exam coaching," Singh added. General Rawat said, "Few amongst you will become the District Magistrates and SDMs. And you will be able to help the other children." Out of 40 students enrolled under the project, 35 boys were given coaching provisions at Srinagar and five girls at Delhi. In the IIT-JEE result declared this year, 26 boys and two girls cracked the mains exam. Further out of 28 students, nine students made it to the prestigious IITs. "These students have set an example before others to follow. He complemented Petronet for their efforts in supporting these children. The job which they are performing is not small and they are making a real contribution in the lives of these students with their sincerity and commitment," Singh said. The minister appreciated the students for their result-oriented approach and also lauded the Indian Army for its contribution. "We are indebted to the Indian Army which serves the nation not only in the times of disturbance, but also in the times of peace by working in various situations like flood relief measures," he asserted. Super 40 Programme, known as Super 30 in 2013-14, started with the aim of coaching 30 students from Kashmir preparing for IIT main exams. In 2016, the number rose to 40. JEE-Advanced, formerly the Indian Institutes of Technology Joint Entrance Examination (IIT-JEE), is an annual engineering college entrance examination in India. It is used as the sole admission test by the 23 Indian Institutes of Technology (IITs). Major General R.P. Kalitha, under whose supervision this initiative is being conducted, lauded the Kashmiri students for their exemplary handwork and dedication towards their studies. "The Youth of Kashmir are very intelligent and hard working, and with the facilities that were provided, gradually the results also improved from 2013. This year in the main exams, 26 boys and two girls cleared and in the Advanced phase, nine boys cleared the exam. I think it is a great result since the institute is only three-year- old," he said. Major General Kalitha further said that the programme was gearing up to intake 50 students, including 45 boys and five girls. The initiative is jointly financed by the Corporate Social Responsibility Leadership and PETRONET LNG, Ministry of Petroleum.